Create a personal campaign page. What can you do with a personal campaign page? Raise money among your friends and family for Camp Hope--a summer camp for HIV-positive youth. 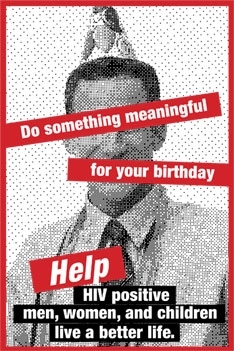 Ask your friends and family to give on your behalf instead of buying you a birthday present. Throw a dinner party and invite your friends to donate to help end HIV/AIDS. 1. 2019 - Click here to create a page for events taking place in 2019, e.g., Camp Hope 2019. 2. Once you gain access you may post a picture and write personal notes to your donors. 3. You will be issued a private website link to use in your invitation or announcement. 4. Make a difference in the lives of others.